This story has been updated as AMD has announced the 32-core / 64-thread top-end Threadripper 2 CPU. As we announced yesterday, AMD will be upping the core-count on its upcoming Threadripper 2 processors when they launch in August. At its Computex press conference this morning AMD officially announced the extended core-count of its most advanced CPU range. Motherboard and cooler manufacturers have been working on new products to comply with the chips’ new specs and explained to us they were adding in extra energy headroom to cope with the demands of what is surely Threadripper 2’s extra cores. 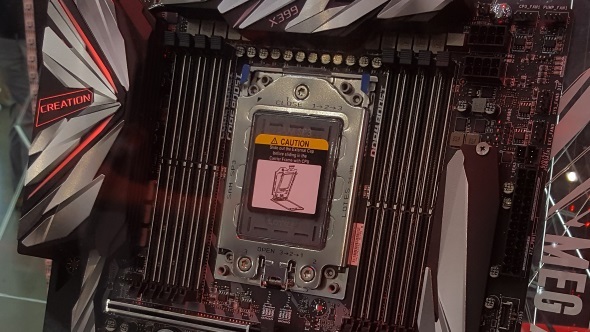 MSI has been displaying its latest X399 motherboard, from the Creation range, at Computex today and, when we spoke with representatives from the motherboard division, they explained to us the company needed to change the spec to a 19-phase digital power design. This was necessary, we were told, because MSI expected Threadripper 2 to arrive with more cores than the first-gen design. We also spoke to the chip chilling folk at Be Quiet, and its Dark Rock Pro TR4 cooler has had to up its game, and expand its cooling plate, to now cope with a 250W TDP Threadripper. That’s because the top of the range new AMD Threadripper chips will come come with a TDP of 250W. The original 16-core Threadripper 1950X only has a TDP of 180W by comparison, which makes it a TDP rise of nearly 40%. We had expected AMD to follow the same route from the first-gen Threadipper as it took in the move from Ryzen to Ryzen 2, by keeping the number of cores static, but that is not the case. There will be a host of new Threadripper 2 CPUs, with AMD showing off both 24- and 32-core processors running today in its Computex press conference. It showed the 24-core chip blazing past the Core i7 7980XE in a Blender render, in just 29 seconds, with the Intel chip given a water-cooler and the 24-core AMD CPU making do with a simple air-cooler. The 32-core Threadripper 2 processor was then shown running a more intensive Blender render, but again just using an air-cooler. Even more impressive is the 32-core chip will still be running in the same X399 TR4 socket the first-gen chips operate inside. Intel did announce at Computex yesterday that it would be shipping a 28-core CPU by the end of this year. Coincidence? I don’t believe in them. Certainly not in the tech world. The Intel 28-core chip was one of those ‘and finally…’ things in Gregory Bryant’s keynote, but it could also easily have been a last minute addition to the show. 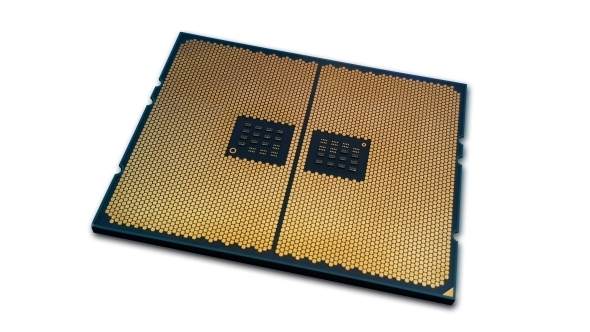 If Intel had gotten wind of what AMD was up to with Threadripper 2 it wouldn’t be surprising to see Intel trying to get in there first with the announcement of a big core-count rise.